This is a weekly post by Nidhal Guessoum (see his earlier posts here). 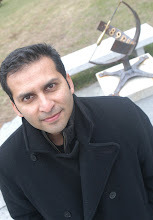 Nidhal is an astrophysicist and Professor of Physics at American University of Sharjah. 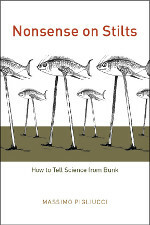 Massimo Pigliucci, an evolutionary biologist who now teaches philosophy at the City University of New York, has just published a book titled “Nonsense on stilts”, with the more telling subtitle “How to tell science from bunk”. It was published by the University of Chicago Press, so this provides it with some backing. The aim of the book is to determine the boundary separating science from non-science. This is known among philosophers of science as the “demarcation problem”, famously addressed by Karl Popper. Pigliucci, however, promptly tells us that not only will it be difficult to find a clear demarcation line between science and “bunk”, we will quickly identify gray zones of “almost science” and “pseudo-science”. This is a very interesting book in many regards, and I’ll try to say a few words about several, though not all, of its main themes; in fact, I will soon come back and devote a post to one of the (few) glaring gaffes in the book, namely its awful (hasty and woefully uninformed) discussion of the Islamic civilization’s contribution in the history of science. Pigliucci first explains the enigmatic meaning of his book’s title on page 4: it is an expression used by the philosopher Jeremy Bantham to mean “a really, really tall order of nonsense”… Thank God there was a clarifying subtitle. And thank God Pigliucci is somewhat well-known in the blogosphere and in some “skeptic” (non-believing) publications, so his book got noticed and talked about, which made me decide to get a copy and read it quickly. Otherwise I and many others would never have noticed his very good book. Indeed, it provides for a very enjoyable read: Pigliucci is spirited and witty, he pulls no punches; in fact, one of the (mildly) annoying (and a bit surprising) aspects of the book is the vocabulary he uses when criticizing his opponents (who range from the creationists to the postmodernists, all the way to the famous “anarchist” philosopher Paul Feyerabend), words like “pompously”, “ranting”, etc. Another critique I might formulate while I’m at it, is that the book spreads itself a bit too thin at times, often getting sidetracked to stories and subtopics that are either well-known or only marginally relevant. The book is divided into roughly three parts: (1) several chapters dealing with Science (hard and soft), “almost science”, “pseudo-science”, and “non-science”; (2) a discussion of how modern Science came about; (3) a critical review of the contemporary debates about Science (the “science wars” with postmodernists and “denialists”, of global warming for instance). The first part is the most interesting, well written, and almost right on target; the second part is the weakest, for we learn essentially nothing, as Pigliucci jumps from Albert the Great (~1200-1280) to Francis Bacon (1561-1626); the third part is all right and quite relevant, though it’s a battle that has been fought at length elsewhere (e.g. the Sokal Affair). The main part is the careful examination of the “demarcation problem”: what makes a subject part of science or outside of its methodology and area of respectable investigation? The good thing about this part is that Pigliucci shows us very interesting cases and explains why it’s sometimes difficult to bestow or deny the Science label on them, cases such as SETI (the search for extra-terrestrial intelligence), Evolutionary Psychology, and even History (yes, history, which, Pigliucci shows, is in the process of being pulled into the bona fide Science domain, though these attempts may or may not succeed in the end). And why is SETI, for example, not clearly within the Science purview? Because it is clear that one could never answer the SETI question negatively, since no amount of negative data will amount to a definite falsification of the research question. Ah, falsification – a very important word and concept! This is what Popper introduced when he famously defined for us what separates science subjects from non-science. To him, and to most scientists since, a topic falls within the Science domain if it can make predictions that can potentially be “falsified”, i.e. proven to be false. A statement that can never be shown to be false is not a scientific one. Interestingly, Pigliucci tells us early on that this “demarcation” criterion is not satisfactory and that developments in the philosophy of science have since made it quite obsolete. However, I believe he is mixing up two different aspects of Popper’s work, two aspects which unfortunately are both usually referred to as “falsification” or “falsificationism”: the first is the simple (“descriptive”) criterion I just mentioned; the other is Popper’s (“prescriptive”) proposition that Science (and scientists) should adopt “falsificationism” as a general approach in their research, namely by coming up with or picking propositions that they can show to be false, thus pruning the subject from one erroneous idea after another, until the correct one is revealed (the last one standing, so to speak). Pigliucci and others show(ed) that this approach cannot work (basically, a hypothesis cannot be rejected just because some data seems to contradict it), and in this he is correct. But this is not the same as the demarcation criterion by which we distinguish science from non-science, and to shed doubt on the criterion because Popper’s “falsificationism” often does not work, only confuses the issue. In fact, as I was reading the book, I could find many statements where our author implicitly or explicitly adopts Popper’s criterion to distinguish “science from bunk”. So, to make a long story short, after a long sinuous treatment and several detours and “intermezzos”, what result does Pigliucci reach in his investigation of “How to tell science from bunk”? He does well to summarize his findings for us in a short concluding chapter. First, he reminds us that there is a spectrum of sciences (ranging from soft to hard, more or less complex, involving human factors or not), and it is simplistic and naïve to believe that “hard” fields are more scientific or even more successful than “soft” ones. Now, what all scientific investigations have in common, according to our philosopher, is three elements: naturalism, theory, and empiricism. Naturalism is the insistence that all explanations be confined to natural causes and factors. Theory is the requirement that there be some explanation proposed of the explored phenomenon (and this is where Astrology fails, in particular). And empiricism is the necessity for any proposed explanation to be confirmed by the experimental/observational (empirical) data.